now reading: Why Do Schizophrenics Hear Voices? Why Do Schizophrenics Hear Voices? In a way, you're never alone. Your inner consciousness is always there to keep you company. That voice inside your head is reliably available for conversation. These intensely personal and comforting self-to-self dialogues are splayed across the humdrum of a typical day. "I think I'll wear the blue polo to my date tonight." "Enchiladas: that's what I want for lunch." "Oh my gosh, cute kittens!" But what if there was a foreign voice inside your head? An entity over which you could exact no control. Wouldn't that be the worst invasion of privacy imaginable? Wouldn't that be disturbing? For the majority of schizophrenics, this dreadful plight is a vexing regularity. Fortunately, schizophrenia is rare, but that's no consolation to the 24 million people afflicted with the condition. Moreover, there is limited understanding of its underlying causes, and treatments -- often in the form of antipsychotics -- are far from perfect, presenting their own loaded plate of perturbing side effects. This is where Baylor neuroscientist David Eagleman enters into the discussion. Widely regarded for his work on the brain's perception of time, synesthesia, and neurolaw, Eagleman is now foraying into the study of schizophrenia. It wasn't something he originally planned on. Back in 2006, Eagleman and his team conducted an experiment in which subjects were simply asked to press a button. Doing so would instantly cause a nearby light bulb to blink. The researchers then added a slight tenth of a second delay between the press of the button and the light coming on and asked subjects to continue pressing the button. For the grand finale, the researchers removed the delay and watched as something completely perplexing happened. The subjects, utterly flabbergasted, insisted that the light would come on before they even pressed the button! For Eagleman, this was an "Ah ha!" moment. Schizophrenics, he says, suffer from something called credit misattribution -- they believe that they're not causing their own actions. 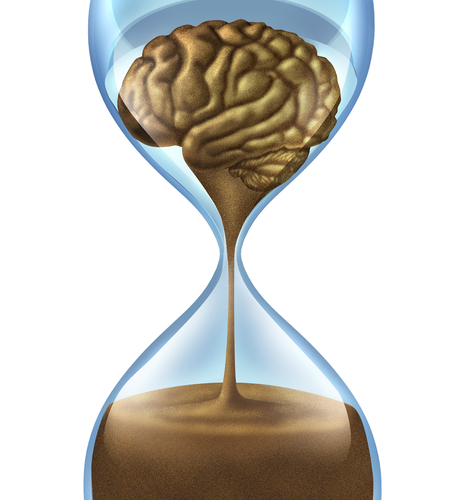 What if this is because their brain's perception of time is off, thus causing an action's effect to seem to occur before the cause? "You're always generating an internal voice and listening to it... But imagine now that you got the timing wrong. So you think you heard the voice before you generated it. You would have to interpret that as somebody else's voice," Eagleman told Science Friday host Ira Flatow. Eagleman's theory has some historical support. One study conducted in 1977 compared schizophrenics' perception of time to that of non-schizophrenics. Subjects were required to work on a task until an experimenter stopped them, and then were asked to estimate the amount of time that had transpired. At judging five-second intervals -- the briefest length of time tested -- schizophrenics significantly differed from the other subjects in their estimations. Additional research is currently underway at Eagleman's Baylor College laboratory. If further substantiated, Eagleman believes that this theory could potentially lead to entirely new rehabilitative strategies for schizophrenia. "Instead of pumping people full of medications, what if we could just sit them down and have them play video games that recalibrate their timing?" Eagleman proposed on Science Friday. Such a treatment would certainly be a welcome, calming remedy to a mental disorder that's anything but.